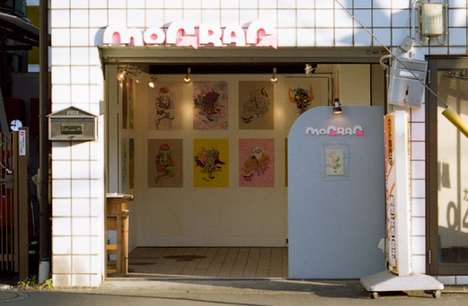 At a small art space in Kokubunji, Tokyo called the ‘mograg garage,’ the pop-art book ‘mograg vol4‘ was released. While previous issues had been released as ‘mograg magazine’ this one was significantly expanded and upgraded to an art book dedicated to the appreciation of denser art works. Crowdfunding was also used to aid in its production. The mograg garage was opened in 2008 in a converted garage in the home of owner Motoko Ota, and Oki Chu, a painter and director of the art space. Instead of being unapproachable, the place is operated as a sort of secret base for art fans looking to freely hang out at the exhibits of artists who make simple, cool and interesting art. Not limiting themselves to just events and exhibits, they also provide wide entrance for fans into the art world in a wide-range of medium, such as the magazines they publish and a radio programming. 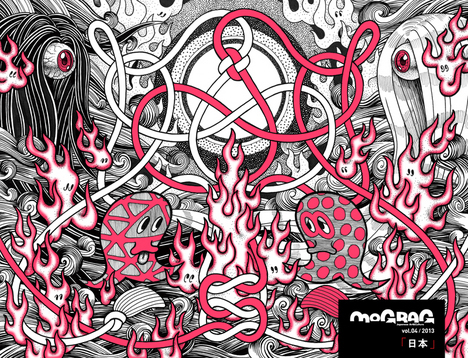 Under the ‘Japan’ theme, the concepts behind the art vary according to the artist. ICHASU, an artist who does illustration and comics, says that he wants to present the typical Japanese visuals and techniques of Ukiyo-e and animation in his own original way. By pairing up art of different tastes, it creates a new work which calls to mind the relationship between each other. The ‘West Style,’ an art unit which has been creating art with the theme of “unchosen future,” decided to use the Fukushima Daiichi nuclear power plant as a motif in their art. Viewers will instinctively imagine their own story from looks of the rough pixelated prints. 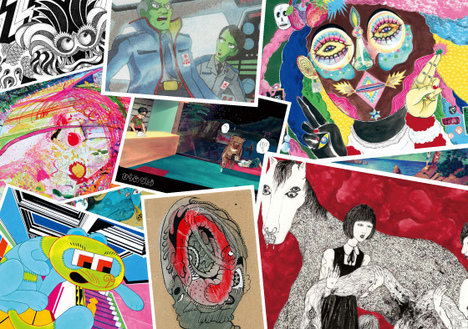 Some artists stand out by of creating art that perceives themselves as a part of Japan. Rather than stiffly drawing Japan-like items, they just draw the places where they live, the things they see and the feelings that they have. Their frank expressions might just represent Japan appearance today. Perhaps you should pick up a copy of ‘mograg Vol. 04,’ and let your eyes dive into the colorful pop art within the book.